70% cotton/30% nylon. UV potective (UPF 45+) and Dupont® Teflon® water/stain repellent coating. Six panel, low profile cap. Neck cape with patented zipper pocket. 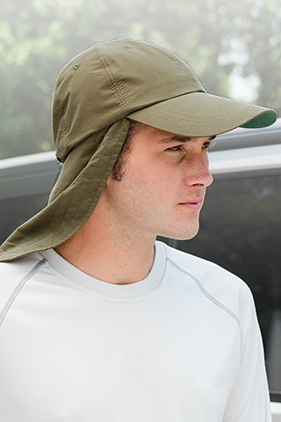 Adams exclusive Cool-Crown™ mesh lining with fabric lining only behind front panel for easier embroidery. Metal clip and cord system to attach to collar. Cord barrel lock closure for adjusting fit. Extended 3 3/4" visor for added protection from the sun. Green under visor reduces glare.